The last afternoon of the 34th Kagyu Mönlam started slightly earlier than usual with a Medicine Buddha tsok practice according to the Concise Ritual of Offering to the Seven Tathagatas, compiled by the 6th Sharmapa. Tsok, in the form of small bags of fruit, was distributed to each and every participant, sangha and lay followers alike, and money offerings traditionally known in Tibet as 'kunki' were also given to the sangha. At the end of the afternoon break, His Holiness Karmapa came onto the stage and the session on the Appreciation of the Sponsors opened with the procession for the mandala offering, led by the sponsors who then sat on the stage for the blessings that would follow. Appreciation of the Sponsors is an opportunity to share and dedicate virtue, and His Holiness spoke at some length on the importance of generosity as a means for generating virtue, and on the equal indispensability of the dedication of the virtue generated. 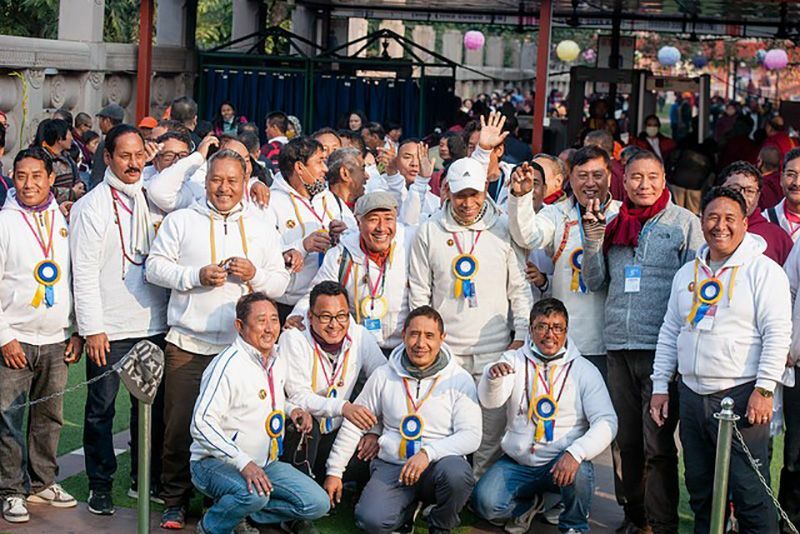 Reprising teachings by Chandrakirti in Entering the Middle Way, he pointed out that wealth and prosperity cannot come about through just any cause, but have their roots precisely in generosity. His Holiness also quoted the Sutra Requested by the Householder Draksulchen on the innumerable benefits of giving: "What I give away is mine, what is left in the house is not. What I give away has meaning, what I keep has no meaning." That is, when we give things away the virtue generated subsists into the next life, whereas whatever we grasp we must leave behind when we die, he explained. However, virtue accumulated, if not dedicated, may be destroyed through unskillful responses such as anger, wrong views, regret, denigration, and pride and boastfulness about our own generosity. His Holiness used the simile of the drop in the ocean, which remains until the whole ocean dries up, to illustrate that virtue dedicated to bodhichitta is not wasted until enlightenment; and further quotes from Shantideva, Maitreya and the Kriya tantras, to argue that all virtue dedicated, whether ours or others', increases and becomes itself a cause for achieving Buddhahood: "Many rivers flow, each with its own flavour, yet when they reach the ocean, they all taste of ocean." The greatest recipients of generosity are the Three Jewels, especially the noble sangha. In generosity to sangha there is virtue in offering and in accepting. Here in the Mönlam there is great virtue, here is gathered the virtue of the three times for us to dedicate. His Holiness especially commended Goshir Gyaltsab Rinpoche for his sponsoring of the Mönlam, making it worthy of dedication. And certainly the attendance of Goshir Gyaltsab Rinpoche, Yongey Mingyur Rinpoche and Yangsi Bokar Rinpoche in this last afternoon, as in the previous days of the Mönlam, heightened the participants' sense of the auspiciousness of the occasion. The essential proceedings of the Appreciation of the Sponsors then got under way: in synch with the chanting of the Offering of the Eight Auspicious Substances, the Offering of the Seven Articles of Royalty, and the Offering of the Eight Marks of Auspiciousness, their representations were successively brought to His Holiness to be blessed, and taken round to the sponsors to bless them in turn. 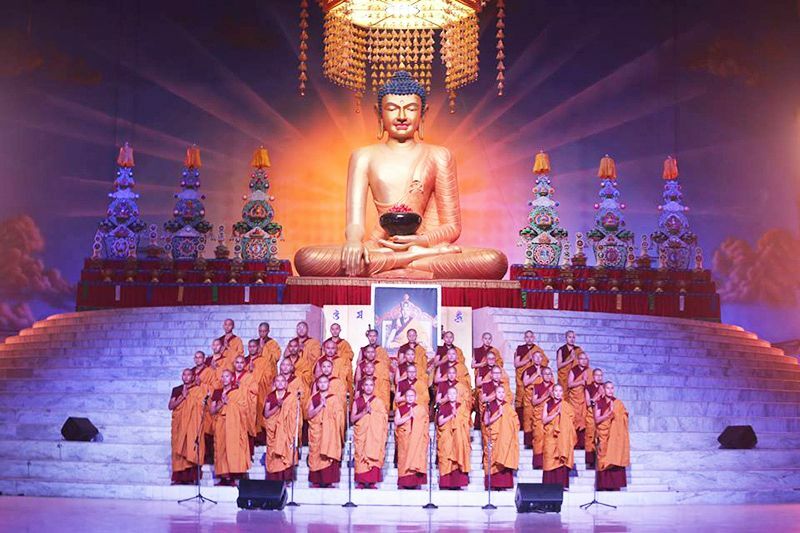 In conclusion, extolling once again the virtue of sharing in the benefits of the sponsors, His Holiness offered a statue of the Buddha to each of them, and gifts were also made to the sangha present on stage. "I thought that Rinpoche was separated from his parents and brought to India at a very young age—before the age of one. From the time he was very young, he had a lot of difficulties. I thought, 'How dreadful. The poor guy!' I’d never had that thought about him before, but I did last year. He was given the title of a tulku, and of a high lama in particular, and because of that he probably has the same feelings about the difficulties he faces as I do. 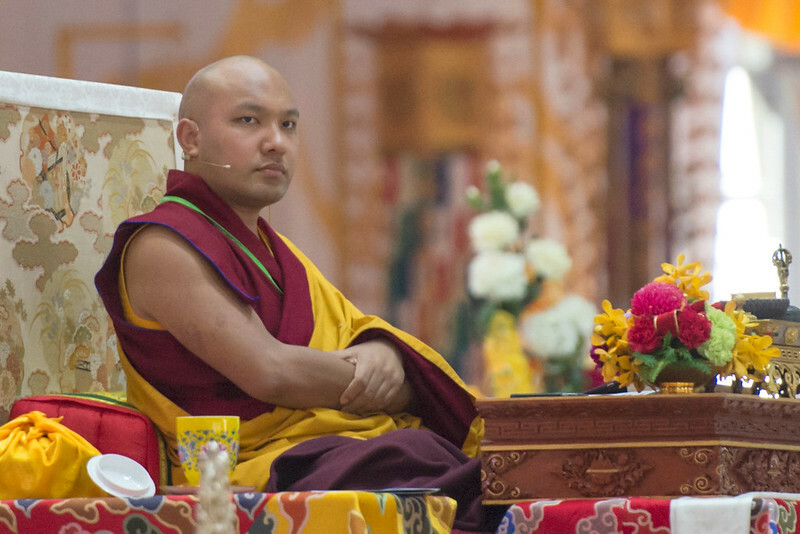 It has been many years since I was given the title of Karmapa, and I have experienced many difficulties myself." "Often I was unable to show Rinpoche how I cared for him. 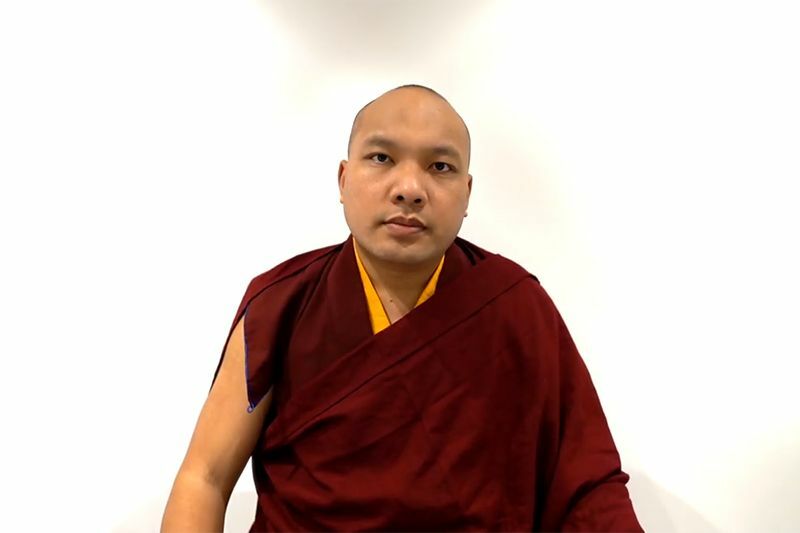 So I would like to take this opportunity to apologise to Rinpoche, the Jamgön Labrang, and all the students who are connected with him." The previous Jamgön Kongtrul Rinpoche's passing away at a young age created difficulties, this adds even more difficulties on top of that. I'm sure that the Jamgön Labrang did all they could with pure motivation, so I ask the Labrang and sangha not to get discouraged. I also ask the students, friends and sponsors of the Jamgön Labrang to continue with their support, so that the activity of the various Jamgön Kongtrul incarnations can increase. That’s about all there is to say. I have done everything I could up to now. I’m not someone who has abandoned all faults and developed all qualities. But no matter what happens, I continue to think I won’t give up on benefitting Buddhism and sentient beings. Please everyone keep that in mind. 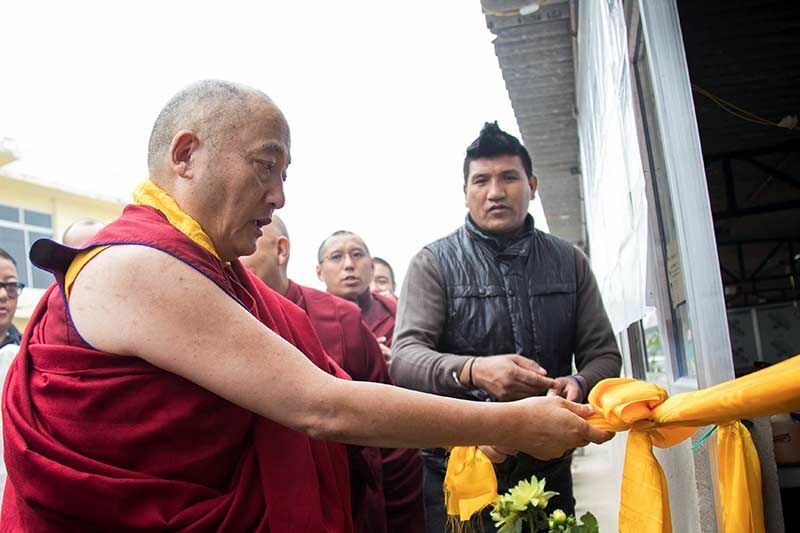 After the reading of the Great Aspiration and of the Dedication for the Living and Deceased—and a reminder that it was through the sponsoring of these prayers that the Mönlam was made possible—His Holiness took the time to extensively thank all those whose contribution had ensured a successful 34th Kagyu Mönlam: Lama Chodrak, and all the tulkus who had worked very hard alongside everyone else; Tergar Monastery, Yongey Mingyur Rinpoche and all the workers there who had offered 100% support; the Kagyu Gunchoe, whose workers had become Mönlam workers too; and the workers from the Tsurphu Labrang who, whether operating in ordinary circumstances or in the whirlwind of the Mönlam, made everything possible for it to go well. Thank you, Gyaltsab Rinpoche, for coming and presiding over ceremonies. Thank you, Mingyur Rinpoche, for your hospitality and your blessings. Thank you, Bokar Rinpoche, for being here, your predecessor was a life force of the Mönlam. 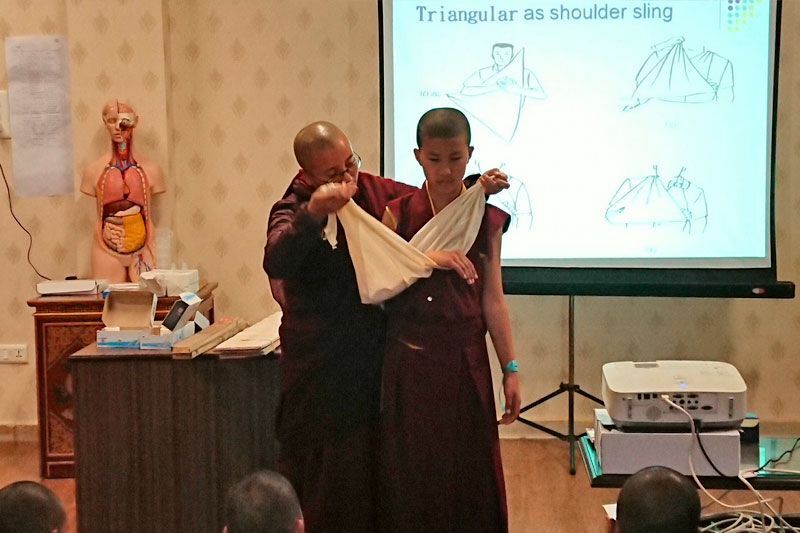 I would like to thank all the tulkus, all the teachers, and all the sangha from our monasteries and nunneries and from other lineages. I thank you from the bottom of my heart. Over 50 countries are represented here and I thank you all for coming. We are realising the noble wish of the 7th Karmapa by coming together to pray. Every one of you, I thank you all. The 34th Kagyu Mönlam ended with images of beauty and unity in aspiration that could not but make a deep and lingering impression in the minds of all present. At every refrain in Lord Marpa's Song of Auspicioness, in the Auspiciousness of the Great Encampment, and in the final Prayers to Accomplish the Truth, Mönlam participants waved their katas in ripples of unison, firstly accompanied by the Karmapa's throwing of rice in blessing, and then led by the unfurling of his own white kata. At a last sustained call of jalings and dungchens, His Holiness left the Mönlam stage, and the curtain fell on the intensity of this unique week.